TUCKER, Ga. (April 10, 2019) – Students at Tucker Middle School have some peace of mind as they cross the street this week. On Monday, the City of Tucker activated a new, solar-powered flashing crosswalk on Idlewood Road. 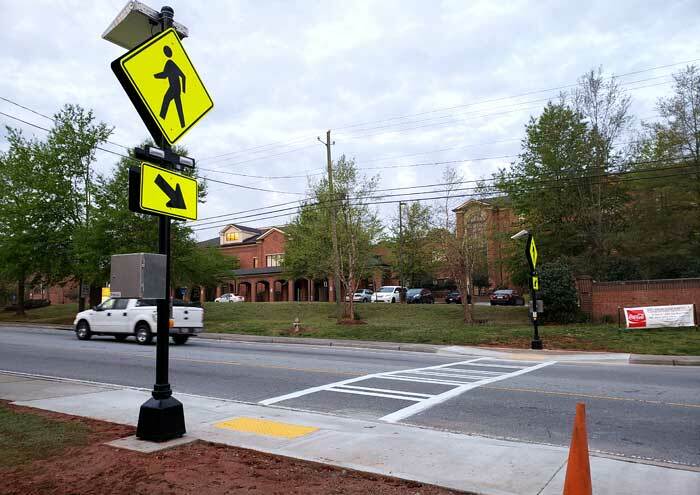 The crosswalk, built out by G-Force Construction and overseen by Jacobs Engineering, is located on the north side of the school, about 1,000 feet south of Lawrenceville Highway. Thanks to the engineering professionals at Jacobs, the project was completed well ahead of schedule and significantly under budget. The City of Tucker is home to seven Tucker Cluster schools – five elementary schools that feed directly into Tucker Middle School and Tucker High School. All of the schools are part of the DeKalb County School District.